There is told a story of a man who owned a huge tract of land in the countryside. One day he woke up to the news that gold was being discovered in a neighboring country. Hurriedly, he sold his farm and left in search of gold. He spent all his money on explorations. But he found no gold. The money finished. The dream of owning a gold mine was dashed. But he was still a family man; he needed to pay the bills and put a roof over the heads of his family members. He found a job in one of the gold mining companies as a driver. One day as he made a delivery he met the man who bought his land. The man was selling gold. The difference is, he was not a delivery man. This was his gold! The piece of land he sold for a song was a gold mine. This man went looking for a mine which was under his feet the whole time. How many times in life do we embark on a journey to look for opportunities? What we need is to look at what we have, both within and without. Granted, there is nothing wrong with going for greener pastures. 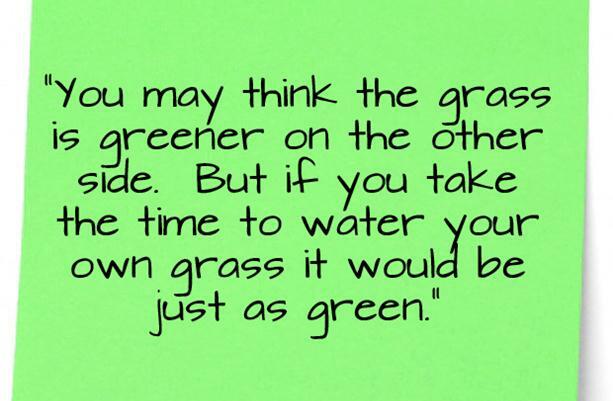 Just make sure that those pastures are indeed ‘greener’ than what you are stepping on right now. Is it not strange that people admire our inner strength and yet we ourselves are completely oblivious to its existence? . The opportunities you need are in your hand. If you spare a moment to look, you will find they are plentiful indeed. The gold mine is under your feet. Posted on November 30, 2013, in Motivational and Inspirational and tagged gold, Gold is under your feet, greener pastures, opportunities, Posted by Isaac C. Mwiya. Bookmark the permalink. Leave a comment.